The development of a molecule which appears to stop a protein forming into clumps could lead to new treatments for Alzheimer's disease, scientists say. The onset of the disease has been linked to plaques which form when fragments of the protein, amyloid-beta, gather into clumps in the brain. The Howard Hughes Medical Institute and Stanford University researchers say lab tests show the molecule stops this. They told the journal Science they hope to begin tests on animals next year. Despite 30 years of research, scientists have made little progress in developing drugs that inhibit interactions between proteins. This is, in part, because the drug molecules are many times smaller than the proteins, so even if they can attach themselves to the larger molecules they are too small to prevent other proteins binding elsewhere. We hope that our work will contribute to the development of therapeutic agents that will eventually prevent Alzheimer's, or delay its onset. The latest study got round this problem by creating a molecule that was able to attach itself to another protein found in the brain cells. Thus the molecule was effectively able to increase its size 15-fold before binding to the amyloid-beta protein fragments - greatly reducing the ability of other fragments to gain a foothold. As a result, the molecule proved effective at reducing protein clumping at concentrations 100 times lower than other blocking agents that have been tested. 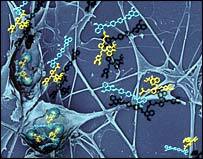 It also seemed to reduce the toxicity of the rogue protein to nerve cells. Researcher Dr Isabella Graef told BBC News it was possible that the molecule could be modified to attach itself to even larger 'chaperone' proteins, so that its bulk would be increased 50-fold. At present the work has only been carried out in the lab, but Dr Graef said the team hoped animal tests would start in a year. She said: "We hope that our work will contribute to the development of therapeutic agents that will eventually prevent Alzheimer's, or delay its onset. "What we have developed is a completely new way of designing drugs to inhibit protein to protein interactions, not only in neurodegenerative diseases, but also potentially in other diseases, such as HIV and cancer." Rebecca Wood, chief executive of the Alzheimer's Research Trust, called the research "striking and original". However, she stressed there was no way yet of telling whether the molecule would work in a human brain, or whether interfering with chaperone proteins would produce side effects. "There is clearly much work still to be done, and it will be necessary to investigate this drug further in animals such as mice before this potentially valuable method can be tried in patients. "This is the first, exciting step in what could be a long path towards a new treatment for Alzheimer's disease." Professor Clive Ballard, research director of the Alzheimer's Society, said: "There are many exciting approaches currently being investigated to target the accumulation of amyloid, some of which are already being investigate in clinical trials."